Gluten Free Cookie Recipes, easy to make, even easier to enjoy. Try our three tasty varieties of Gluten Free Cookie Recipes. The ever popular chocolate chip cookies are a particular favourite with children. 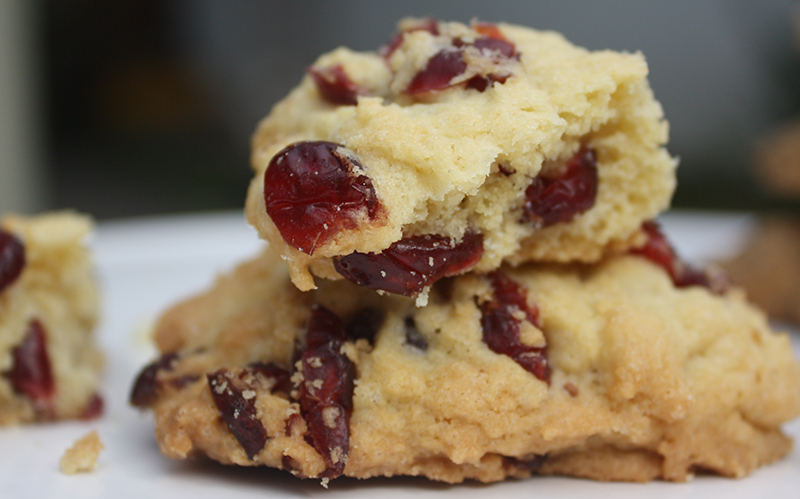 The cranberry cookies and sour cherry cookies are a particular favourite with grown-ups. These Gluten Free Cookie Recipes were some of the very early recipes the Wheat Free Woman adapted when she was diagnosed with a wheat allergy. She had been given the original recipe by an American relative when she was young and she had loved making them, and eating them! So when wheat had to go from her diet, she quickly started experimenting with adapting the recipe to be wheat and gluten free. The resulting gluten-free cookies are a real treat. We often have these with our tea and coffee and we have included three of our favourite gluten free cookie recipes for you to try. All varieties of these gluten-free cookies freeze well once they are made. However you can also freeze the dough. When you want some cookies it is easy to defrost the dough, shape into cookies and bake as normal. These Gluten Free Chocolate Chip Cookies are easy to make and a real favourite with children. Why not get your children to help make them well as eating them. We have used a dark chocolate in our recipe but you can make them with whichever chocolate you prefer. The dried cranberries in these Gluten Free Cranberry Cookies give it a moist and chewy texture and a great cranberry flavour. This is the Wheat Free Woman’s favourite of our gluten free cookie recipes. These Gluten Free Cherry Cookies have the same moist and chewy texture as the cranberry cookies. However they are made with dried sour cherries which are less sweet than the cranberries and seem to bring out the richness of the butter.